Inscription: (Verso) inscribed by the artist "E marmaro antiqus" in brown ink. Secondary Inscription: (Verso) "d historie van Niobe/na antijq No 169." in black chalk and "26" in red chalk and "Jan de Bisschop/1628-1671" in graphite. The sons of Niobe, queen of Thebes, flee from the arrows aimed down at them from a cloud by the Greek deities Apollo and Diana. Horses trample the bodies of the dead and dying, while two other sons throw up their hands imploringly on the left. In the story from Ovid's Metamorphoses,Apollo and Diana killed Niobe's seven sons and seven daughters to punish her for being too arrogant. Jan de Bisschop conveyed the scene's drama through energetic motion and repetition. 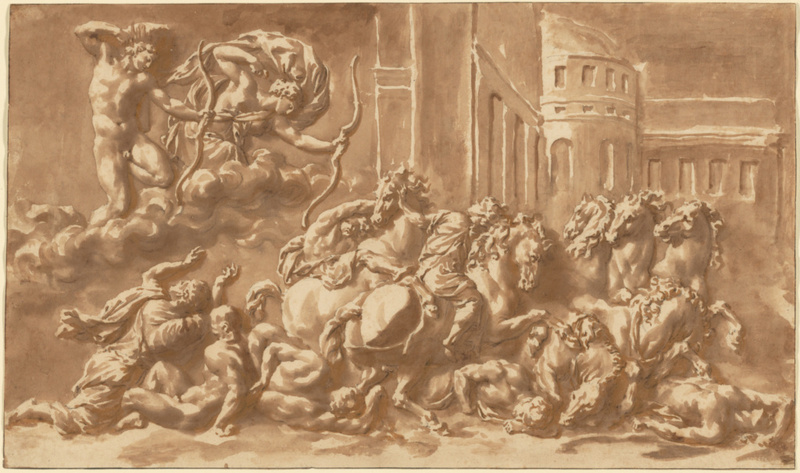 Using a characteristically Baroque, sweeping horizontal composition, he interwove human figures and horses into a tangled frieze that moves from left to right. An inscription on the back of the drawing shows that the artist based the scene on an antique relief. To create an almost sculptural, two-dimensional impression, de Bisschop used a strong mixture of black chalk and brown wash, creating highlights by letting the bare paper show through.